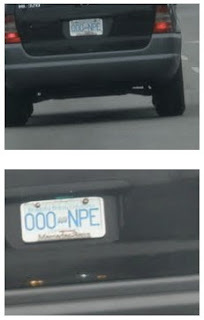 The significance of this odd spotting will probably only make sense to computer programmers (NPE = Null Pointer Exception), but a few days ago, Mila and I were following an SUV with license plate 000 NPE, which is quite amusing. I don't think it is a customized vanity plate – here in British Columbia, license plates have three numbers followed by three letters, or three letters followed by three numbers. It could be a genuine coincidence. posted by Jonathan at 5/18/2012 11:01:00 a.m.
By Anonymous, at 3/05/2013 1:57 p.m.
By Jonathan, at 3/06/2013 8:27 a.m.